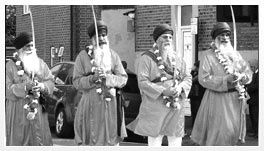 Our Mission is to advance the sikh religion and its beliefs of universal brotherhood, selfless love, peace and harmony among people, within communities and around the world. This is to be achieved by preaching, promoting and practicing the sikh religious observance, tenets and doctrines within the framework of sikh history, heritage, traditions and culture and by spreading the teachings of our 10 Gurus, our Holy Saints and other wise men. Gurdwara Nanaksar reaffirms the principles of selfless service and meditation and follow an open house policy by welcoming and serving people from any religion or group. We invite you to visit our Gurdwara for a wonderful experience of peace and tranquillity, to enjoy the Kirtan (music and chanting of holy verses) and to share a fellowship of meditation and service.